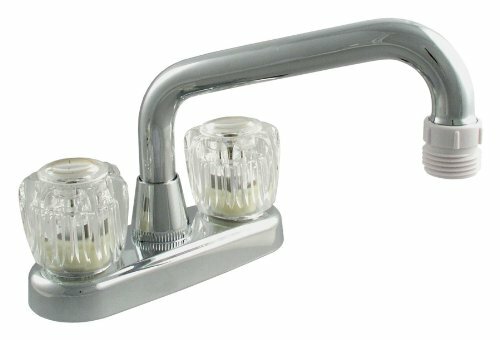 LDR 012 5205 Laundry Faucet, Dual Acrylic Handle, AB1953-Non-Metallic, Chrome. Chrome Finished, Laundry Faucet features a Non-Metallic Construction, Dual Acrylic Handles and a 4-Inch Center Set. Hose Adapter is included. LDR faucets are constructed for years of exceptional performance. Manufactured in United States. View More In Laundry & Utility Faucets. If you have any questions about this product by LDR Industries, contact us by completing and submitting the form below. If you are looking for a specif part number, please include it with your message. Zurn Z843M1-RC Chrome-Plated Cast Brass Sink Faucet with 6" Vacuum Breaker Spout, Lever Handles, Pail Hook, 3/4" Hose End and Brace, 8"
Chicago Faucet 445-L9E1ABCP Full Flow Outlet Two Handles Wall Mount Sink Faucet, 3"-8 3/8"